Vern Burkhardt (VB): You say, “Innovate or die…” It’s that serious a matter for companies, large and small? Robert F. Brands: Absolutely. 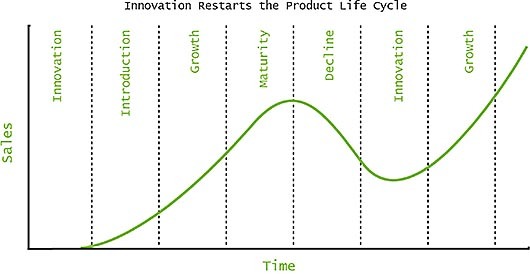 Ask yourself, “Where are you on the product lifecycle extending from innovation to introduction, growth, maturity, and decline?” I invite you to attach to this interview the chart from my book which portrays this lifecycle. VB: ‘Implementing innovation is about taking the organization and doing a “reboot.”‘ Is that a good summary of the key message of Robert’s Rules of Innovation? Robert F. Brands: For most companies a “reboot” is the way to go. For others it’s a matter of optimizing the systems and processes currently in place. Either way, whether you are doing reasonably well with innovation or starting new efforts, it is important to take a holistic approach in order to deliver sustainable innovation. Let me put it in different terms, we are all familiar with Total Quality. This is like Total Innovation. It is not about doing one process or element well or on time. It’s creating a repeatable process that delivers results and improvements over and over again. VB: Robert’s Rules of Order work best when everyone in the meeting is familiar with them although the person in the Chair should be an expert in applying the rules. Does the same apply to Robert’s Rules of Innovation? VB: ‘When an idea is discovered and implemented across the value chain with success, a “sweet spot” is hit…’ What do you mean by sweet spot? Robert F. Brands: A sweet spot can be compared to hitting the bull’s-eye of the white space. It is areas of opportunity, complemented by demand, and fulfilled by the optimal product or service at the right price. VB: Are entrepreneurs who insist on filling the innovation team leader role likely a risk to their business’ long term profitability? Product development processes are established in organizations in order to provide a discipline in the innovation process and to ensure the input and involvement of all of the departments involved. These processes ideally guide and encourage innovation initiatives rather than inhibit them. They are more a matter of “checks and balances” to avoid forgetting important elements and steps. VB: One of your surprising tips, in the ‘Inspire’ Robert’s Rule, for establishing and maintaining an innovation culture is having regular in person meetings chaired by the CEO or designated leader. How can meetings which often put further pressure on people who are already busy be a good thing? VB: “Often, the most successful product development managers are the most facile, accomplished, and successful salespeople within the company.” Aren’t most of the best salespeople prone to being too impatient to engage in the extent of collaboration and discipline the process requires? VB: One of the top 5 R&D metrics you identify is total R&D head count, which was used by 59 percent of companies in the 2008 survey. What does this metric indicate that is of significance in measuring the output of a company’s innovation success? Robert F. Brands: Unfortunately nothing. Many of today’s metrics are no guarantee for success. In particular most public companies report percentage spent on R&D. However, when I see 10% of a company’s labor pool being utilized to deliver new products and services, I would think that this is an indication of a serious effort. Or even better the number of patents filed. Robert F. Brands: I don’t think so. What is more important is that leaders get used to using the right leading and lagging indicators. Leading could be hours spent in development; lagging could be percentage of new product sales. VB: In your interview with a network of business associates in various industries around the world, which is transcribed in your book, a unique metric is mentioned: “measuring the rate of promises made and promises kept” in reference to a strategic set of brand promises. Do you think all companies should consider this approach? VB: You say product development people have a “Zen-like ability to conjure new concepts and test and retest prototypes.” Would you elaborate on this Zen-like ability? VB: You talk about innovation leaders facing the devil’s advocates who fear change and work to undermine innovation efforts at every turn. Should these “Anti Body” types be encouraged to be more positive or even removed from an organization, or do they often serve a useful role? VB: One innovation leader you quote in your book observed that in order for a team to move beyond incremental innovation to disruptive innovation it should be composed of people with different skill sets, and from different backgrounds and business groups. He also said the champion or driver of the process that the team follows must “break down barriers to resistance and get everyone playing nicely and, more importantly, productively in the proverbial “sandbox”.” Do you agree that recapturing our childhood innocence and enthusiasm helps us be more innovative? VB: When talking about the increasing numbers of multinational innovation teams, you describe what you have found to be the attributes of people from the U.S., France, Brazil, and China in terms of how they react in a meeting environment, approach the concept of ‘teamwork,’ and communicate with others. You didn’t describe the national traits of people from the Netherlands, your original homeland. What are they? Robert F. Brands: Patents are intellectual property. The fact that patents are filed and obtained is a pretty good indication of an individual’s or company’s creativity. Robert F. Brands: Perhaps not so much a summary of best practices, but it definitely provides a holistic approach to describing all of the elements that are required to deliver sustainable innovation. On the website for Robert’s rules of innovation we have posted tips and are sharing latest thinking and best practices. Maybe on balance Robert’s Rules of Innovation is the best practice for creating sustainable innovation. I hadn’t thought of it that way before. Robert F. Brands: Innovation to the Core by Rowan Gibson, although a little bit more textbook-like, is a very useful book. Most books written are by imperative of the 10 rules I shared. On our website we identify the “Best Books” for each imperative as including Rethink by Ric Merrifield, The New Age of Innovation by C. K. Prahalad, Design Driven Innovation by Roberto Verganti, Creating Competitive Advantage by Jaynie L. Smith, The Innovation Zone by Thomas M. Koulopoulos, Bricklin on Technology by Dan Bricklin, The Blue Sweater by Jacqueline Nofogratz, How the Mighty Fall by Jim Collins, and What Would Google Do? by Jeff Jarvis. Robert F. Brands: Brands & Company, LLC has a network of innovation coaches who provide companies and organizations a way to evaluate, improve, and deliver innovation. The focus is on helping leaders deliver profitable growth through sustained innovation. Our consulting services include crating action plans for business management, marketing, design and development of new products, and management of intellectual property. Using the Robert’s rules of innovation we can help companies create and sustain “new” in their businesses. VB: You relate the case of a mentor providing “feed-forward” instead of “feedback.” Do you use this approach in your consulting practice? VB: In Robert’s Rules of Innovation you talk about the foaming hand soap product development success at Airspray. Was that innovation your proudest moment in the business world? VB: Were there other candidates for Robert’s Rules that, although relevant, were not quite significant enough to include in your book? Today’s web however has allowed us to add learning materials and examples through weekly Blog posts. On our book site we have added additional articles by imperative/rules under each letter. Like Inspire. Another is does a “Chief Innovation Officer” inspire your team? VB: “…I dedicate this book to my entrepreneurial grandfather, whom I looked up to, and who inspired me.” Would you talk about his entrepreneurial talents and how he inspired you? VB: While writing Robert’s Rules of Innovation did other topics arise as being good candidates for another book? VB: You say you’re a control freak. How did you discover this approach didn’t work for promoting innovation in an organization, and how did you learn to temper this tendency? Robert F. Brands: Being a control freak does not help in a creative and innovative environment. I learned to work around it by applying a methodology I picked up from Ronald Reagan who called it “empowerment with verification” or “trust with verification.” This approach worked well for me. His ten Robert’s rules of innovation are described as “rules of order.” They are rules that must be “implemented, maintained, protected, and fostered – fiercely – in order for your innovation program to succeed.” Given Robert F. Brands success as an innovation leader they are definitely worthy of careful consideration. Robert F. Brand’s professional experience includes positions as Manager of New Consumer Products at Philips Lighting Company, and Manager and International Trade Advisor for the Netherlands Chamber of Commerce (U.S.). From 1989 to 1993 he was Marketing Manager of Consumer Lighting for GTE/Sylvania Lighting Division where he developed consumer marketing programs for this $210 U.S. million division. In this capacity he orchestrated the development and launch of groundbreaking new products and packaging designs like Double Life bulbs and Dual Graphics. 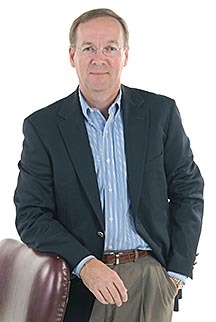 From 1993-1995, he was Vice President of Marketing at Sterling Plumbing Group, Inc. where he directed all advertising, sales promotion, market research, pricing, product management and new product development for the Sterling retail brand which primarily services big box chains like Lowes and Home Depot. From 1995 to 1998 he was Vice President of Marketing at Kohler Company where he led marketing efforts for Kohler Plumbing Fixtures, which is an $800U.S. million operating unit. At Kohler he was responsible for line profitability, product management, pricing, market research and all other marketing services. Under his stewardship as President of Airspray Int’l, Inc. from 1998 and as CEO of Airspray starting in 2004, the Dutch public company created the international market for instant foam dispensing which delivered consistent double-digit profitable growth. After Rexam’s acquisition of Airspray NV in May 2006 and until August 2007, Robert F. Brands was responsible for Rexam Dispensing Systems with eleven sites and about $400U.S. million in sales. He implemented best innovation practices initially in the Dispensing Systems division and later in the $1B Personal Care Division that aided in numerous and significant new product introductions, such as L’Oreal’s most successful consumer product introductions in years. Robert F. Brands is the author of Robert’s Rules of Innovation: A 10-Step Program for Corporate Survival (2010).